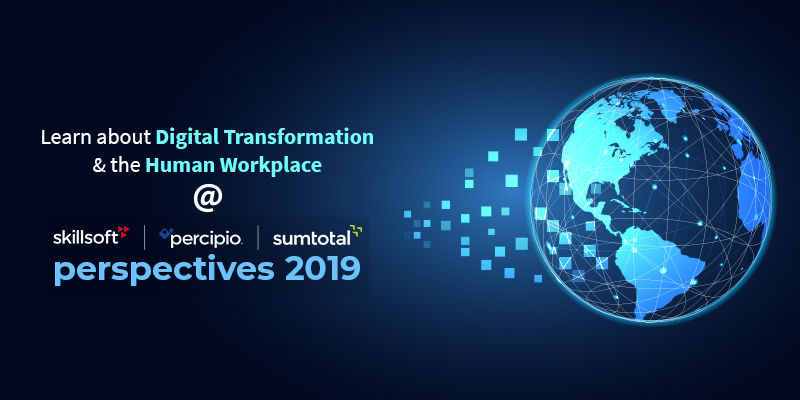 On our first visit to the Skillsoft Perspectives 2019 website, We came to a full stop: Is “Accelerate Your Learning Workforce for Digital Transformation” just a string of buzzwords or is this the real thing? Digging into the schedule of keynotes, workshops, and lectures reveals that this year’s conference is about enabling the talent, the technology that supports the talent, and culture that make our organizations fit for survival in the new digital world. The term “digital transformation” has been misused and abused for nearly three decades. As Forrester® Research Director Martin Gill said in a recent interview, it means everything and nothing. However, it’s not all because of marketing hype. Much of the confusion is that we conflate digitization, digitalization, and digital transformation. Digitization means converting analog information (documents, audiotapes, videotapes, etc.) to digital form. We have been doing that for decades, but in the modern era it entails new technologies like Robotic Process Automation, the Internet of Things, and cognitive computing. Digitalization is merely the process of converting analog to digital. Digital transformation is using talent, technology, and culture to fundamentally change the way we deliver value to customers. One example is in the way John Deere morphed from merely selling tractors to enabling better crop yields with IOT sensors, GPS, and AI. The tractors still exist, but they are only one component in the enabling technology. What drove the change was the new understanding that farmers don’t want tractors – they want better yields to drive profit and sustainability. Transformation discussions often revolve around technology, but digital transformation is about dealing better with change overall and making change a core competency. Another reason we have trouble getting our arms the concept is that it is so vast. When we try to create a precise definition, it escapes us, or we ramble on so long we lose our way. Not every company is a John Deere. How you deliver value to customers is different for every organization, but the imperative to get ahead of changing customer demands affects all. Regardless of the nuances in your industry sector and company, the three enablers — talent, technology, and culture — remain fundamental. With so many worthwhile sessions having the same time, you will no doubt find it difficult to choose among them. We’ve reviewed them and chosen a few that will be of most interest to you if you are in the midst of digital transformation or planning it for your organization. This session starts the conference with a promise to relieve some of the mystery about how digital transformation applies to your workforce. We look forward to their thoughts on how to deal with the potential rift between those struggling to keep up with current technology and those who are working to transform your business. Supporting employees who want to develop themselves is essential to growing an agile, creative workforce and keeping good performers. Morné Swart will present talent strategies to improve the employee experience and individual development. No doubt you have heard about “daily energy maps” and similar techniques to improve your productivity, but Daniel Pink has looked at timing research in many disciplines and written a comprehensive book about it. He teaches everything from timing daily activities to when to start a project, launch a career, present an idea, and found a business. Help your people be their most creative by learning the intricacies of human timing. You can get a preview in this YouTube clip. This session will focus on how we ensure our people are ready for any new digital requirements they may need. Employees expect their organization to prepare them for the new roles that digital transformation will create. Individuals want to work for organizations who are leaders in the digital space. Yet 70% don’t believe they have the right skills or operating models to adapt. To prepare for the future of work, executives must stay ahead of the curve. Progressive leaders must engage their workforce to think through how trends affect the nature of work inside and outside the organizations. We expect to hear that HR has the mandate to enable talent to do more than just in establishing a learning adapt to the change — innovative talent must leverage technology to shape it. There’s a lot going on during this time slot, but we are interested in an organization that got a late start in establishing their learning and development function but is enjoying some early success. Cathy and Karlene will begin with the business case for why becoming a learning organization is critical, then share their foundational strategy and framework for transformation. This session provides more about the transformation to a learning organization. This session covers the definition and perspective of Learning Organizations, the infrastructure building in readiness for becoming a Learning Organization, and programs for the future. Learn about gaining the right insights and linking them to the business context. This session will explore how to identify meaningful metrics found in learning data and discuss how those metrics can be given value-based context. The role of L&D is morphing from content creator to content curator. This session is about how a small L&D team responded to the need for on-demand development in a variety of ways. Learn about our experience moving from a small set of Skillsoft online modules to getting executive support for a robust enterprise-wide platform, Percipio. This the story about how they did it. Becoming digitally aware begins with effective reporting. SumTotal Product Management will provide an interactive roundtable session to provide your suggestions for enhancing and improving SumTotal Reporting. In addition to your feedback and input, Product Management will provide insight into new and innovative options they have been working on to enhance your reporting experience. In a modern organization, L&D needs to pivot from learning to performance, meaning employees need access to learning on demand to satisfy their immediate needs. Learn how L&D professionals can develop strategies to distill relevant high-quality content quickly, contextualize and organize it effectively, and develop robust learning journeys that motivate learners. We’re easy to spot – we bleed orange!